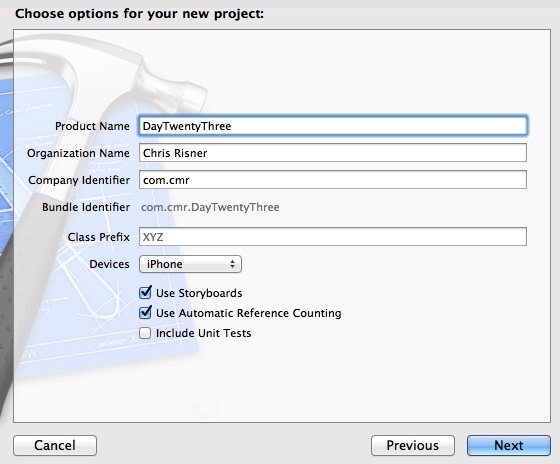 Welcome to Day 23 of the 31 Days of iOS. Yesterday we wrapped up a two part series on using the camera and photo gallery to get access to pictures. Today we’re going to switch gears and talk about using background threads. We’ll first explain why it’s important to know how to do this and then we’ll go through a simple example of how to do it. We’ll be starting with a brand new project, but if you’d like to follow along with the completed code, you can access it here. Here we’re putting a sleep (using NSThread sleepForTimeInterval) in a for loop. The effect of this is that we’re doing some very time intensive processing. It will take a full six seconds before the viewDidLoad method is finished. 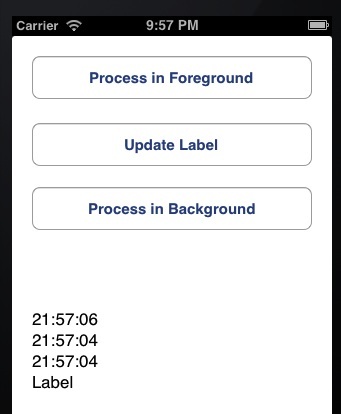 This means that our UI won’t load until these 6 seconds of processing are complete. Now the for loop in the code above is very meaningless and would never be found in a good application (or even a decently coded one). 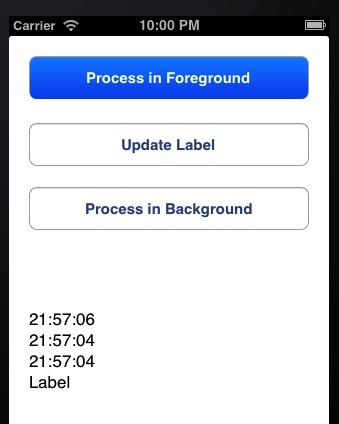 However, it wouldn’t be hard to do a similar amount of REAL processing. Just think of needing to pull down several images when loading or having to hit a slow responding server or do a lot of file processing. Now some of these things already have ways of wrapping a lot of the processing so you wouldn’t have to worry about it (such as doing asynchronous web requests using NSURLConnection’s sendAscynchronousRequest. In situations where iOS and objective-c don’t wrap the functionality in a way that prevents it from occurring on the UI thread, you can use background threads to prevent hanging up the UI. Let’s dive in and look at an example of how to do this now. Now we can implement some processing. All we’re doing in this method is getting the current time and converting it into an NSString. We then use that to put the current time at the top of the label (by appending the label text to the current time’s NSString value). Now we can run our app and better understand locking or hanging the UI thread. The reason this happens is that as long as we’re doing all that processing within the method directly called by the UI, it’s preventing anything from being processed. So, even though you’ve tapped the button to update the label, it doesn’t update. However, the taps DO go through once the UI thread returns. This is really the best we can hope for because we still want whatever the user has done to go through after our processing returns, but it’s far from optimal. Instead, what would be best, is for the processing to happen in a background thread where it won’t lock the UI thread. We’ll do that next. We first call dispatch_asycn and send in the dispatch_get_global_queue method to get the DISPATCH_QUEUE_PRIORITY_BACKGROUND. 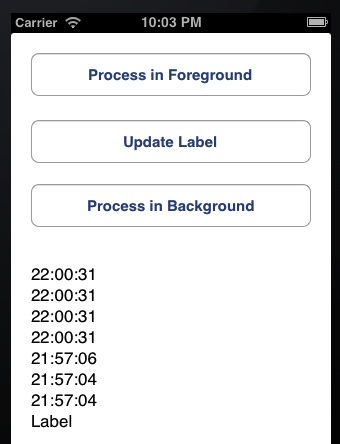 This background queue is kind of a default very low priority queue that can be used for low priority processing. dispatch_get_global_queue is used to get shared concurrent queues, of which the background queue is one of them. We also pass a block of code that will do the same processing we did above. 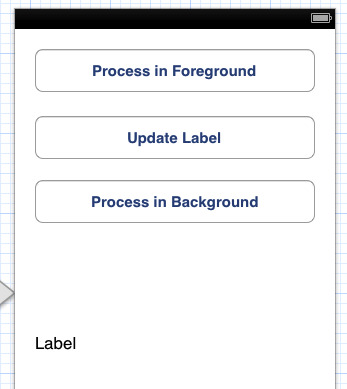 Now if you run your app and tap the Process in Background button, you’ll be able to tap the Update Label method immediately after and it will update the label. This is because we’re doing our EXTREME processing in a background thread and not on the UI thread. Today we talked about why it’s important to consider what sort of processing you’re doing on your UI thread and how you can see the impact of doing too much processing. Today’s example was fairly arbitrary as it wasn’t really doing anything, however, there are many different things you might do in an application that could take a long time. 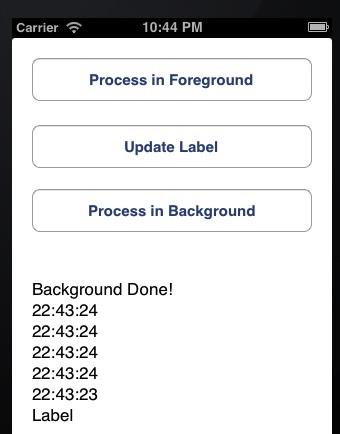 If you find yourself doing these things in your app, using a background thread is a good idea. It’s important to know that we just skimmed the surface of what you can do with, and how you can do, background threads. If you’re interested in doing anything more advanced, I’d recommend you do some research into dispatch queues, Grand Central Dispatch, and NSOperation. The point is that the iOS threading system can get very complex if you want it to. You may need to go beyond the global background queue. You can download the completed code from today’s walkthrough here.